Being a person who loves writing and finds it therapeutic too, I often wonder how I manage to slip into blogging inaction this often! Wait. Is that sentence even grammatically correct? Maybe I will lose the ability to write proper sentences if I do not write regularly.Aaargh!! Let me get started! So what made me break this as usual long hiatus? 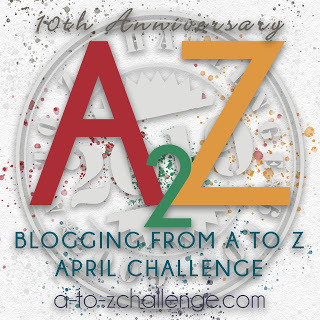 I happened to stumble across the AtoZ blogger's challenge and really liked the idea. The rules say that participants must base every post on one letter of the English alphabets, in order. Now, that is a nice idea for a head that is currently empty as far as blogging ideas go. A bulb glowed in my head and I decided that the posts would be based on places that I have traveled to or want to visit in future. But then, I am writing just for the love of writing alone. (Ahem!Did you notice how mature I have become :)) I may not even take the trouble of tagging the posts to the A to Z challenge. I like to think of my blog as more of my journal. A place where I can pen my thoughts without badgering someone to listen, even as they wonder how to escape from my unwelcome thoughts that I am resolutely dumping on them. And yet, if someone wants to listen, they still can and stop midway or even mid sentence if they find it uninteresting. How I wish this was possible in the physical world too! Anyway, so much for breaking a long break! I feel so refreshed for having written all this down. So dear blog (like dear diary :)), I will hopefully maintain this momentum and come back with posts everyday. Thank you for never turning me away! 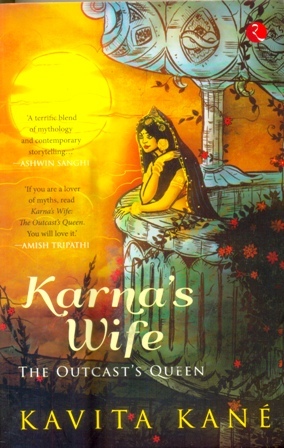 Continuing with books based on the Mahabaratha, this post takes a peek into the epic from the eyes of Bhima and Urvi(Karna's wife). I wrap up the Mahabaratha series with another gem that retells from Draupathi's perspective. An excerpt from this work was included in my college syllabus and then I had to lay my hands on the full version :) A translated work from Malayalam, the story is Mahabaratha retold from the perspective of Bhima. Bhima is portrayed as the strongest among the Pandavas and the true lover of Draupathi. His marriage to Hidimba and their relationship is dealt with a fair level of detail. Being a well translated work that gives a fresh perspective to the epic, I found this to be an enjoyable read that deepened my understanding of the Mahabaratha. It makes one realise that there will be as many versions of the epic as the characters themselves! Karna is the most enigmatic character in the Mahabaratha and is quite an anti hero. The story of Karna is all about inner conflict and mental turmoil. In spite of being a person of royal descent, an archer whose skills exceed that of Arjuna and a highly fair and just human, his doom seems to be pre-written. Fate controls his life all through to make him face pitfalls in every sphere of life. The author has done complete justice in bringing out what this great hero goes through in his lifetime and makes the reader completely empathise with him. We get know about the everyday life at Karna's palace, the deep love his foster parents and brother have for him and his relationship with his two wives, Vrushali and Urvi. The story itself is narrated through the eyes of Urvi and we get to know a great deal about this not so well known character who plays an important part in Karna's life. The frantic attempts made by many of the main characters of the epic to avert the war, the horrors of the war and its aftermath are dealt with in great detail. Urvi shines as a becon of hope during the war, with her natural flair for healing of the wounded. The author ends the story saying that Karna's son became the last human on earth who held the knowledge of all the highly powerful and destructive weapons of that era. He takes it to his grave as a secret ensuring that their horrors are never unleashed on earth again. This book is one that makes the reader think and reflect a lot about the power of fate, inner conflicts between right and wrong and the horrors of war. 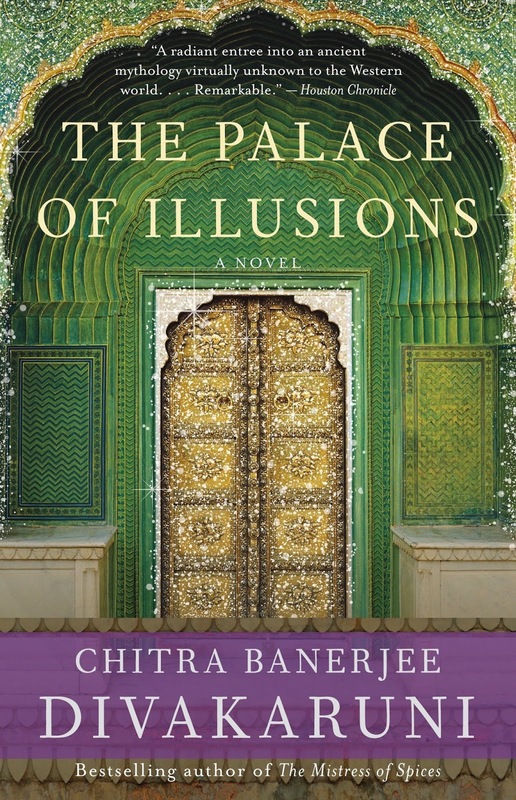 In this book, Chitra Banerjee retells the Mahabaratha from Draupathi's perspective. There is a good amount of detail as far as the epic story goes and the author draws the reader into Draupathi's mind as the events unfold. She too, like Karna, seems to have her all her wishes bend before the all powerful destiny. Her mind dwells on the apparent injustice of it all at every turn, grapples with it and finally accepts it all. Like all the other books based on the Mahabaratha, the winning point in this one too is how the futility of war is highlighted.At the end, the winners lead a life of regret after such a huge scale of killing and bloodshed. Victory tastes stale and they simply pass days, as if waiting for that very same death to take them away too. I remember this book for its interesting narration and beautiful language. A highly recommended read for anyone who loves the epic. 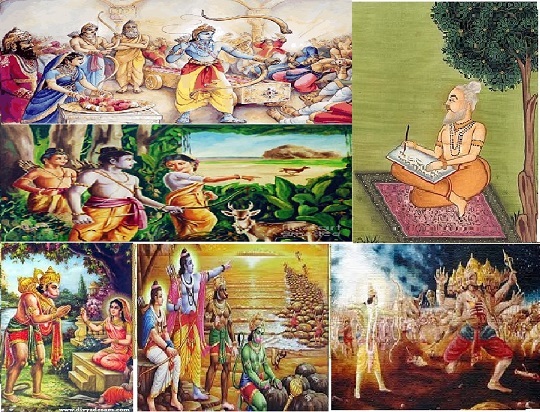 A brief about this series if you are reading this part first - The Great Indian Epics series is a multi part post on the Mahabaratha and Ramayana. More specifically, reviews on the books based on these two epics (those that I have read so far). The intention is to encourage readers to pick up a few themselves, enjoy and benefit from knowing about these two epics that are verily epitomes of our culture and to feel proud of our great and ancient history. To be able to read extrapolations of sub plots and creative re-tellings, one must first know the original version. I recommend 'Mahabaratha '- By C.Rajagopalachari for this purpose. The Mahabaratha is a huge epic and the himalayan proportions of names, relations between them, and sub stories can puzzle any reader. In his book, Rajaji tells us the main story with the most important details along with the necessary sub plots. Very well written and an absolute page turner, this book can be the one to educate the reader about the epic in totality. I read this book when I was in class 6 and to this day, this one remains to be my favorite version. 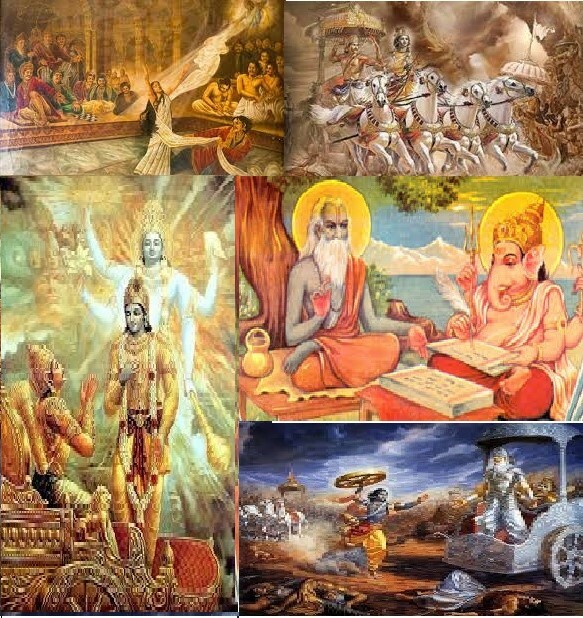 Today,as I write this post, I can still see in my mind's eye, the scene of Arjuna shedding his disguise as Brihanalanna, twanging his Gandhiva as the chariot rolls into the battlefield and shooting arrows at the feet of Bhishma and Drona as he passes by, as a sign of respect. I can still fell the goosebumps that sprouted in my hands and the awe that filled my 11 year old self as I read it. So vivid and enthralling is Rajaji's storytelling. I strongly feel that especially children who are going to read the epic for the first time must read this kind of a relatively puristic version before they start thinking about how it could have otherwise been. It creates a sense of awe and respect for our country and it's culture before it is put under scrutiny and validation. It is certainly not wrong to do so, but one must know well before questioning, is it not?! 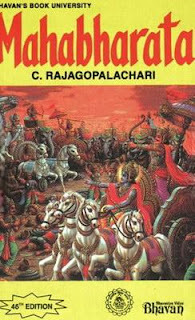 'Yajnaseni' is Mahabaratha retold from Draupathi's perspective.As the title suggests, Draupathi or Yajnaseni (the one who emerged from the Yagnyakunda or the portals of the sacrificial fire) is the protagonist in this retelling. Drapathi is addressed as 'Krishnaa' in the book, a name she gets because of her dark coloured skin. As a dark skinned beauty, a voracious reader and a woman with high intellectual prowess, she stands out amongst the 'usual' royal women who are drunk with vanity and revel in their pampered lifestyle. 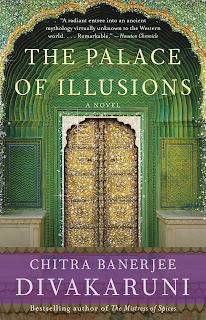 One of the main themes of this book is Krishnaa's love for her Lord Krishna. She is the lord's 'Sakhi' who pines for his company and her devotion for him shines forth in the book. 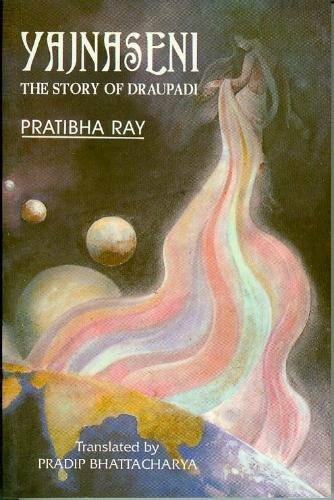 Pratibha Ray also highlights Draupathi's sense of helplessness over her destiny. She makes the reader thoroughly empathise with the lady whose wishes are always overruled by what is meant to be. Another strong emotion that is felt by the protagonist and makes a lasting impression on the reader is the futility of war. The book beautifully brings this out through Drapathi's thoughts, as she watches the massacre, its aftermath and the pointlessness of a kingdom won after so much bloodshed. This is something we will all do well to have in mind in the present day world too. The book is very well written and is a beautiful extrapolation of the epic from the eyes of one of the most important characters of the epic. Note - I read this book about ten years back and have highlighted whatever my memory has retained. Originally written in Odia by Prathiba Ray, the English translation by Pradip Battacharya is a delight to read. 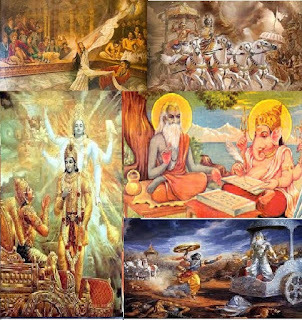 The most priced possessions of our country's ancient culture have been passed on to us in the form of our two great epics - the Ramayana and the Mahabaratha. The stories grip readers to this day. The moral dilemmas faced by the various characters resonate with our hearts and the path that each one of them took, hold a lot of relevant lessons for humanity even today, after hundreds of years. That apart, the characters themselves are so colourful and multifaceted. Some of them are bold and strong, some meek and quiet, a few others enigmatic. Having so many sub plots and branches, they are also full of scope for interpretations and re-inventions. We now have quite a handful of modern authors trying their hands at re-painting these ever fresh stories with colours of their own perspectives, interpretation, imagination and of course, extensive research. While the original story itself seems to deal with majorly black and white situations and characters, the modern authors tend to paint more of a grey picture that finds greater acceptance in today's world. Sita is not just a demure, husband abiding chaste wife but has a strong voice of her own which she makes sure is heard, when needed. Her following Rama to the forest is not just an act of wifely chastity but a stubborn refusal to part with her husband.Kunti is not wholly a goodness personified mother who follows dharma relentlessly, but also a woman who plots quite a bit to keep her sons united and victorious. The Pandava brothers do have their differences but simply choose to stay united. Also, a lot of characters who are just mere mentions in the popular re-tellings of the epics, become protagonists in the modern versions. Their role, strength of character and lofty sacrifices occupy an entire book. Another common trait among all these books is the awe inspiring lessons to be drawn that serve as a good reminder and inspiration for our everyday lives. All these apart, we also come to realise how advanced we were in the fields of science, astronomy, medicine, architecture and weapon science, to name a few. As against the popular notion of India being a 'developing' country, these epics prove that we were the most developed nation then. And that too at a time when the 'developed' nations of today were still hunter gatherers. We have sadly lost the connect with our past and have grown to believe that everything western is superior. Even more appalling is the fact that we question our own history and call them 'myths'. We need to change this public opinion and modern authors are doing a great deal towards this cause by kindling the interest of India's young readers with their books. Being a great fan of these mighty epics and having enjoyed reading quite a few versions of the original epic and modern extrapolations, I would like to reminisce the reading experience by extending it to the written word too! What follows is a series of reviews on all the books that I have read related to the Ramayana and the Mahabaratha. I hope you enjoy reading them and in the course, pick up some of the books to read them yourself. Come, let us embark on a wonderful journey through our rich past! A way too long hiatus and the pen beckons .. Even as I type this, hiding inside a room with the door locked, I can hear my child wail outside as my husband frantically tries to feed him dinner. My heart palpitates faster and I dread hearing a harried cry - ' Aarthy, chapadamatengaraaaan' (He is refusing to eat). Sigh.. Life has come to living for myself in intervals. Steal some time to read while the little one sleeps, clean the house when he goes to school(2 hrs is too less I tell you! ), savour 10 minutes of shower time like it was an exotic holiday.. It is quiet outside. I assume meal time has kicked off well. Yay! I can finish this post! So why did I take such a long break? I could say I was busy raising my 100% dependent baby or was too harried to do anything other than sit and stare into blank space whenever I got some precious off time. But, it all boils down to lack of will. Period. Sad but true. I have been doing other things too - besides housekeeping and child rearing. Just that writing took the back seat for a while. A long while. Anyways, am back. And as I write, I realise that writing remains to be as therapeutic as it always was! I have loads of travel posts and book reviews to write. 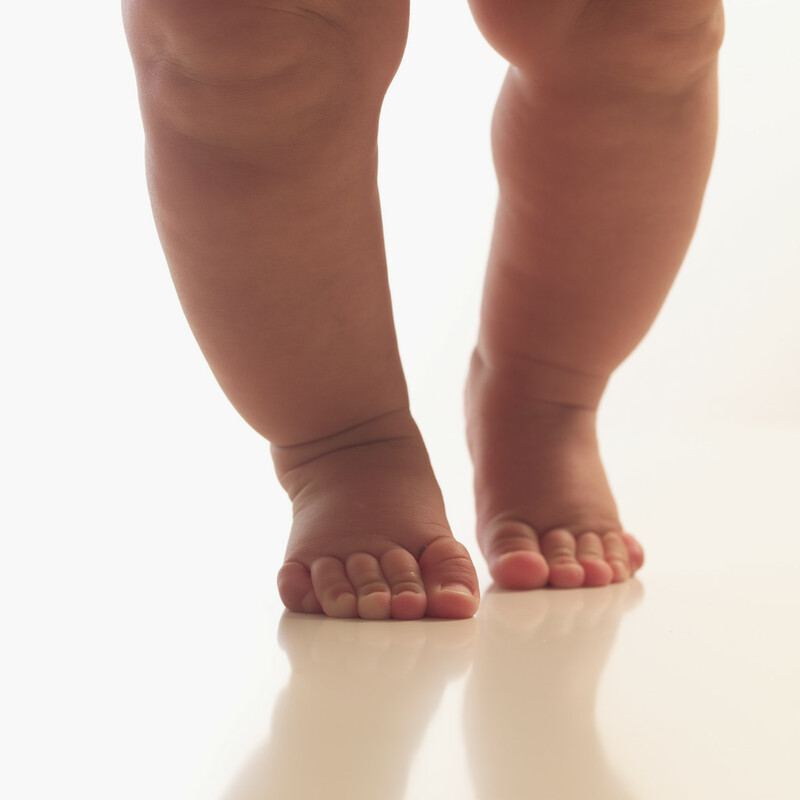 My kid is already two and half and the last post I wrote about him was his first step. As a new addition, I have parenting musings too. Its all getting too heavy inside my head and I fervently hope to go on an unloading spree. Oh what would I have done if not for this dear blog who patiently listens to everything that I have to say! Did I tell you it would be a record worthy event if I managed to finish this post uninterrupted? Not to be! Child wailed, the dad wailed even more and I just came back after finishing the last phase of kid's dinner and a tantrum. Mind Voice: Do you really think you will manage to write? Me:Yes.I need to. I will. Let me give it a shot atleast? I classify this as one of my most phenomenal reads and I think it is because of the extraordinary life that this book is about. Richard Branson's autobiography has all the makings of a Hollywood blockbuster - runaway success, adrenaline rushing adventure, unbelievable conspiracies, poignant moments and heart warming incidents of humane kindness. In 'Losing My Virginity', Branson recounts how he went about creating the mammoth Virgin group, brick by brick.We also get to know about the kind of person it took to build the Virgin Empire. As I read on, I was completely in awe of his hunger for challenges, the way he embraces change, moving on from one industry to another, success close at his heels. All has not been easy of course. The perseverance with which he has braved the huge inevitable challenges as he runs his businesses leaves the reader spellbound. His ability to pursue adventures alongside his demanding entrepreneurial journey is truly inspiring. The way he has put his neck on the line more than once during his epic attempts at flying hot air balloons around the world, creating records prove to be a nail biting read. But amidst all this, it is his sense of social responsibility that really won me over. One can sense his sincerity when he writes about his empathy with the hardships of the less fortunate and with people during times of crisis like war. The projects he has undertaken to help out this section of society is a source of inspiration. His concern over the world's fast depleting natural resources and other burning environmental issues and his commitment in the form of initiatives to find a solution to these is commendable. Branson has really used his financial resources and contacts to contribute towards making this world a better place to live in. Overall, this book proved to be a very awe inspiring and informative read. I found it easier to read it alongside other books rather than taking it up at one go. It does take some amount of patience and perseverance to get to the end of the book considering the size and subject matter but it is totally worth the time it took. I recommend this to you if you like reading corporate/business stories. Even otherwise, you could read it just to enjoy knowing the life of such a multifaceted personality and get inspired!